We are also very lucky to have a running partnership with Leinster Rugby. 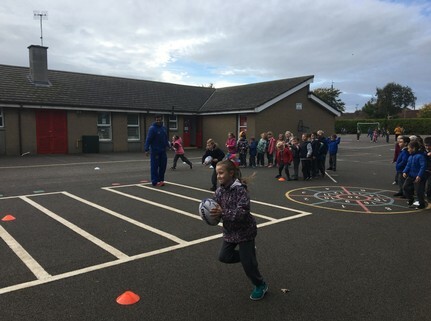 Throughout the year, the children receive coaching lessons from members of Leinster Rugby. Here the children learn fundamental movement skills. They really enjoy games like Tag Rugby and we have even some students who are members of the local rugby club. Our new rugby couch, Aerial has been working with the senior classes this year. 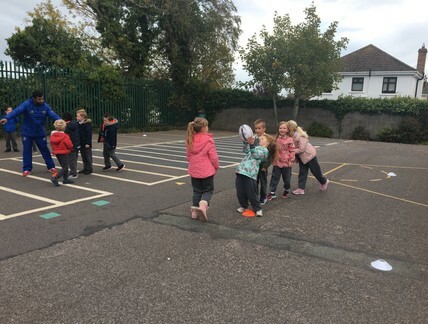 They are developing their throwing and catching skills whilst having lots of fun. Thanks to Leinster Rugby, we had a visit from the Leinster players who won the Heineken Cup. It was great to be able to hold it and get our photo taken with it.